The link above has charts that are updated constantly during market trading. They do not lag market trading and are current. My lines and counts may not be correct as I also look at other things. When possible I try to keep them up to date. An email to me would prod me to update. I think you will find these charts very useful as they cover time frames from minutes to decades. The final section of these charts consists of some of the premier growth stocks that have good structure to their charts. My favorite chart formation is one that declines and stops at the top of a previous congestion area. This reflects good accumulation and a controlled correction. The growth stocks show daily market action for the last 3 years and also weekly moves since 1990. This gives a great perspective to what has happened in the past and how this stock behaved during good or bad times. Debt ceiling solved??? “Cooler heads should prevail”. What cooler heads??? I’m beginning to wonder if I should lump myself into the naive camp where I’ve been putting the tea party. Read my daily comments from last week. A waterfall decline could be the kickoff to a major move. Waterfalls also can mark the ending of a decline. An extended failure to resolve the debt ceiling would seriously hurt the economy and a waterfall would likely be a kickoff, not an ending. It would not be unexpected to see a waterfall soon. This crisis was expected by Wall Street to be solved by cooler heads. I seriously doubt how likely that may be. We will have to wait and see. If serious damage is in store for the economy, can QE3 not be far behind???? Vulnerable positions such as SP 500 futures contracts should have been liquidated long ago when the situation became so cloudy. Stocks on the other hand usually don’t have the volatility that futures contracts involve. It’s a personal thing as to when you sell. For instance, I own a “story” stock that I won’t sell no matter what happens. I am waiting for the “story” to materialize. If it never happens, that money is toast. Such is Wall Street and supidity. I did not issue a sell signal earlier because I thought the head and shoulders formation had “too big of a crowd” to be viable. I still think that but IT’S OBVIOUSLY WRONG. For months I have thought that large step 2 (since July 2010) was ending but I didn’t listen to myself. You can find subtext wordings throughout the previous updates in the intermediate and long term scenarios, but I was too busy hedging myself, just like all the know-nothing stock market advisors. I’ll try not to do that in the future. My question is whether the correction after large step 2 will be a downward correction or a sideways correction. From Jan 2004 to Jan 2005, the market had a sideways correction. With serious problems facing us today, it seems less likely that we will go sideways. The funny thing is all of this could be a giant whipsaw and a change of trend hasn’t taken place. Oh well, if that happens, we will get right back on and ride it higher. A bottom occurred on June 15 and we are in a rally phase that returned us to the May 2nd peak. We may have only seen step 1 up and are now making a double bottom on the June lows (SP 500). The market is in 3 step decline with only step one finished. The rally that began in early July 2010 is long in the tooth and showing its age (13 months). The market internals have been losing momentum and show that the market has been in a lengthy “topping” phase. This topping can continue for many months. If the June 15 rally fails to make significant new highs, the market will have signaled a declining phase marking the end of large step two up. 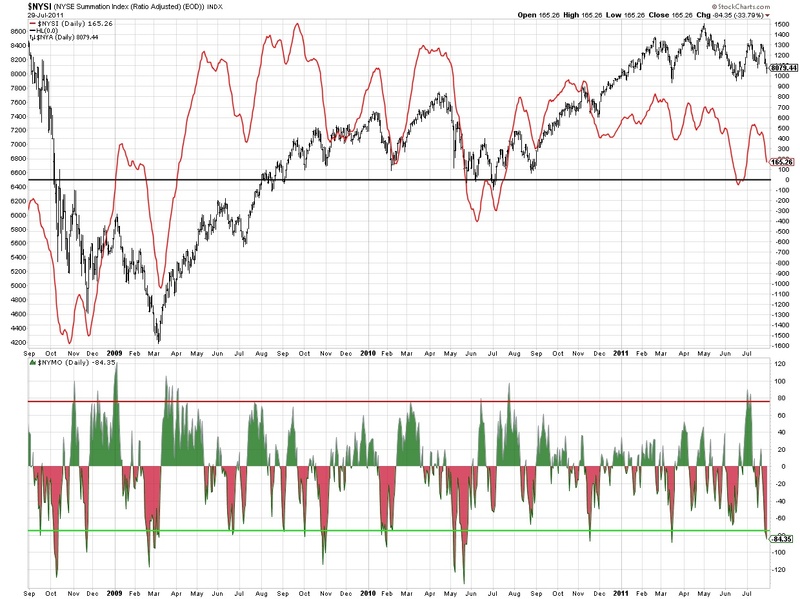 A decline below the June 15 lows would trigger an intermediate term sell signal. Notice in the intermediate term chart that this is the first rally since July 2010 that has failed to make a new high. That is a very pertinent observation to the trend. The market has resumed the rally in large step two that began in July 2010. A February and May decline were the first and second steps down in a larger 3 step decline. If true, this would call for lower prices in step 3 down and would likely continue for many months. The July lows would likely mark the half-way point in the decline. From the bottom in March 2009: large step one up ended in May 2010; large step two up may still be in force. The bull market since March 2009 is not complete and higher highs are ahead. We have begun a significant correction following the second large step up. This correction could last many months. 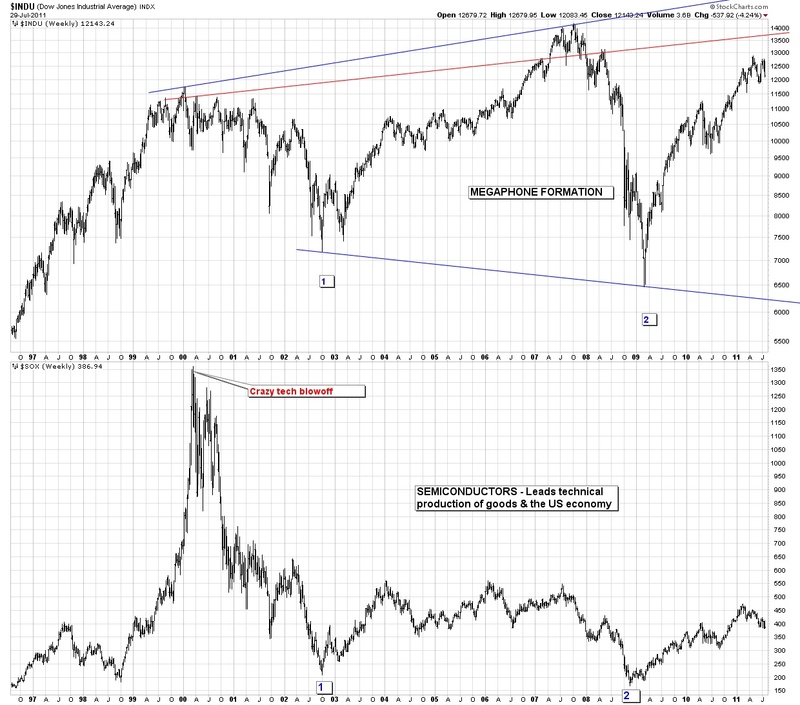 A similar point in the 2003 to 2007 rally had a correction that lasted one year. Since 2000 we have had two bear markets, 2000 to 2003 and 2007 to 2009. Like 1966 to 1974, the recovery from the first bear market saw a new all time high (2007 peak). It is possible that we may experience another all time high during the present recovery period. At the conclusion of the present recovery we will have the third and final bear market. An estimated time for the conclusion of the final bear market is approximately 2018. Glossary is in the sidebar category, Huh???. This is important reading for understanding this blog. For methodology, see the category Indicators. I’m thinking about combining Indicators and Glossary together. Let me know if you think this would be confusing?? ?